Thanks to a reader who has much more experience than I do with finding historical photos of the neighborhood and beyond, I can show you a photo from around 1970 of 4511 8th Avenue. 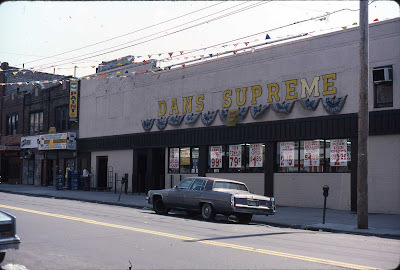 What used to be the Ritz Theatre became DANS SUPREME and later, Steve's C-Town Supermarket. If you enlarge the photos, you can compare prices on items like apple juice. One of the changes is that two of the bricked up windows are now open again. 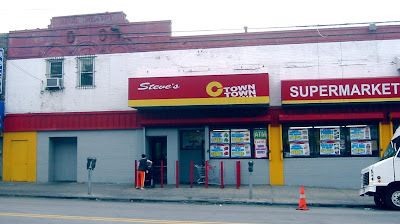 The Steve's red paint also highlights the top facade a little bit more. 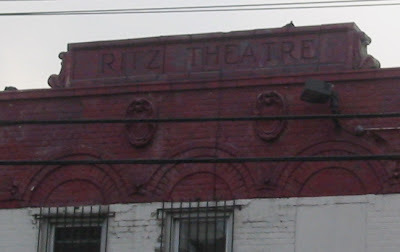 Other than that, you can still see the closed up windows on the second floor haven't been touched or re-touched. Thank you, Tony, for the DANS photo and more to come! I love these before and afters! They are always fun for people like myself who are fairly new to the neighborhood and a great conversation starter for people like my husband who has been here pretty much all his life. Thanks Dan! Hope to see more on your blog, Best View!